For decades, engineering and development drove the design process. Product designers and business owners would ask,“What features should this product have?” instead of “What do people need this product to do?” By the 1990s and 2000s, they started to see the flaws in this approach. It was creating a marketplace full of products that had lots of bells and whistles, but weren’t actually usable or meaningful to real people. That’s when human-centered design and user experience design began to take hold, putting the focus back on the user. Since then, the biggest innovations have come from brands who use design thinking to create the next big thing. 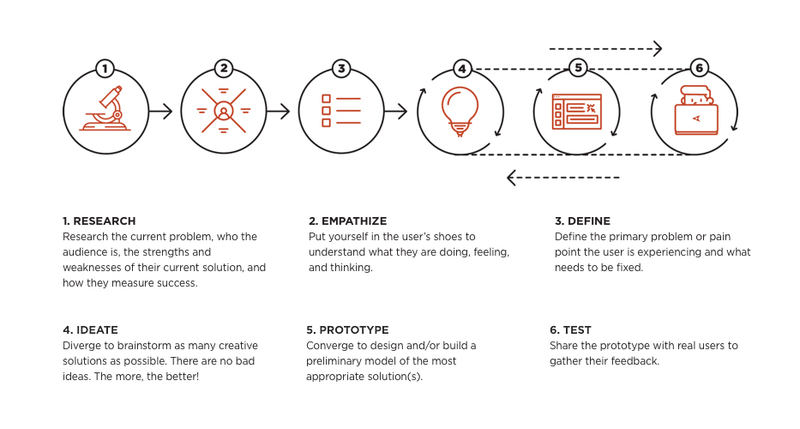 Rather than jumping straight into creation, they start with researching, empathizing with their users, and defining the problem that needs to be solved. Only then do they brainstorm, build, and test solutions. Now, the same shift is happening in marketing. Before the Internet was around, marketers’ jobs were much easier. They would come up with a catchy tagline for a new product, make a few attention-grabbing ads, and watch new customers come running. But then everything changed. Technology has taken over, creating more competition and an endless array of new advertising tactics (many of which are centered around content) that companies felt like they have to use to keep up. Fortunately, content strategy is having a similar effect on marketing that UX has had on the field of design: putting the emphasis back on the user. By focusing on user success, both designers and marketers are unlocking greater business success. Here’s how you can improve your customer journey and achieve better results by incorporating content strategy into your UX design and content marketing practices. Content strategy is having a similar effect on marketing that UX has had on the field of design: putting the emphasis back on the user. According to two Content Marketing Institute studies of 2017 Benchmarks, Budgets, and Trends for B2B and B2C companies, almost 90% of businesses report that they use a content marketing plan, meaning they create and distribute relevant, valuable content as part of their marketing efforts. Most are dedicating around 26-29% of their marketing budget (not including staff) to a number of tactics, including social media, blogs, email newsletters, in-person events, ebooks/whitepapers, video, infographics, webinars, and more. It seems like everyone is capitalizing on content, so it must lead to amazing results…right? In fact, less than 40% of businesses surveyed say their content efforts are “very” or “extremely” effective. Yet the vast majority (over 80%) plan to keep their content marketing budget the same or increase it in the next 12 months. What a second: Doesn’t that seem like a waste? Why would you continue to invest in tactics that are somewhat or completely ineffective? Wouldn’t it make sense to figure out better ways to actually achieve the results you’re looking for? The answer to both questions is “yes.” And it all starts with strategy. Less than 40% of businesses surveyed say their content efforts are “very” or “extremely” effective. Wouldn’t it make sense to figure out better ways to actually achieve the results you’re looking for? What is Content Strategy vs. Content Marketing? Using content strategy OR content marketing can help support your brand’s sales goals and produce decent ROI. But the key to success isn’t doing more content marketing or shifting all resources to content strategy. It’s blending both to ensure you’re delivering the right content, to the right people, in the right way. The key to success isn’t doing more content marketing or shifting all resources to content strategy. It’s blending both to ensure you’re delivering the right content, to the right people, in the right way. The Content Marketing Institute studies show that only around 40% of B2B and B2C companies have a documented strategy. No wonder their results haven’t been stronger! These improvements won’t happen overnight, but by starting with strategy, implementing and testing tactics, and optimizing along the way, you’ll begin to see the impressive results everyone will be buzzing about. Content strategy serves as the foundation for designing and marketing meaningful products. After collaborating with UX designers, developers, and other stakeholders to build a product, content strategists often work with Marketing to create content that will help attract and retain users. Like traditional designers who packed their products with ton of features that users didn’t actually want or need, many traditional marketers have been doing the same with their content. Their content marketing plans focus on what content will be created, but in order to be effective, they need to address the why, who, where, how, and when too. Effective content marketing plans focus not only on what content will be created, but also why, who, where, how, and when it will be created. InVision, one of the leading design prototyping tools on the market, has attracted over 3 million customers, hundreds of thousands of followers, over $132 million in funding in just a few years – thanks, in large part, to content. InVision bakes content strategy into both Product and Marketing. Their content specialists work with Product Managers and Product Designers to help optimize existing products and design new ones, while driving the company’s crazy-successful marketing engine. With their help, InVision has expanded from one basic prototyping tool (which was still a game changer for designers) to a robust product with tons of features, each addressing a key user need. Creating the product was one thing, but InVision knew they couldn’t just have a “If we build it, they will come” mentality. That’s why they’ve gone all-in on content marketing as a way to drive growth. InVision grounds their content marketing plan in a solid strategy that aligns with their business objectives, mission, core values, and audience. To achieve their goals while meeting their audience’s needs, they decided to take a unique approach: having their readers write the content. InVision’s marketing team didn’t just put all their eggs in the blog basket, though. Designers crave a hub they can count on for industry insights, and InVision saw the possibilities for delivering those insights in many ways, from more traditional tactics like in-person events and webinars, to innovative ideas like the DesignBetter online library of resources and the Design Disruptors documentary. Design Disruptors was a content marketing masterpiece. The film featured some of the design industry’s brightest minds talking about the evolution of design. It wasn’t about InVision and barely even mentioned the product, but there’s no doubt the documentary had business benefits. Based on this strategy, Byrd and her team worked with InVision’s designers and engineers to develop an array of digital content and features (like micro-video, disruptor profiles, competitions for pre-access, allowing people to organize community screenings, and built-in sharing functionality). They also partnered with companies in the community to host in-person events and screenings. By starting with strategy and producing relevant, valuable content that consistently strikes the sweet spot between business goals and audience needs, InVision has become a role model within the content community and a leader in the entire design industry. Whether you’re a content strategist, content marketer, or designer, your work plays a key role in optimizing the entire customer journey. Content and design are often considered separate disciplines, but the leading companies know that you can’t have one without the other. By investing in both UX and content (and ensuring there’s collaboration between the two), your brand can create effective, meaningful customer experiences that drive success for your business and users. Curious how you could take a more strategic approach to content and improve your marketing results? Our team at Drawbackwards has been helping companies tell their story through UX design and content for over a decade, and we’d love to share some of the things we’ve learned with you. Get in touch to tell us more about your content challenges and learn how we could help solve them.